The game originated in China, and is very popular in the Far East, Australia and New Zealand. It is, or can be, a gambling game and involves skill, strategy, calculation and some chance. We certainly don’t gamble. but have started to get to grips with the complicated scoring system, and are beginning to learn – and even succeed in collecting – some of the special hands, such as Triple Knitting and Wriggling Snake. We use a standard Mah Jong set which has 136 tiles comprised of 3 suites (Bamboo, Characters, and Circles) plus Winds and Dragons. 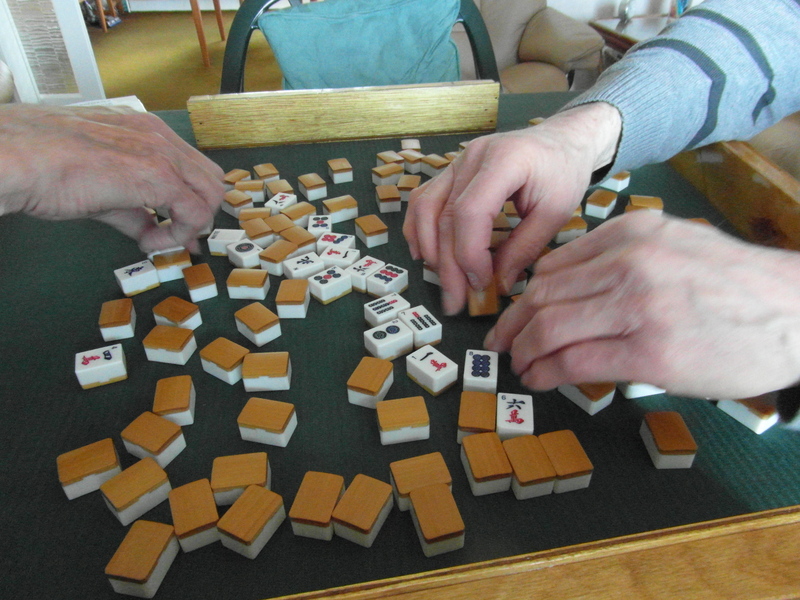 There are a lot of quaint terms: shuffling the tiles is called ‘washing’ them, and if you are within one tile of going “Mah Jong” you announce that you are ‘fishing’. We meet in the afternoon on the first and third Wednesdays of the month.